For other uses, see Delos (disambiguation). Investigation of ancient stone huts found on the island indicate that it has been inhabited since the 3rd millennium BCE. Thucydides identifies the original inhabitants as piratical Carians who were eventually expelled by King Minos of Crete. By the time of the Odyssey the island was already famous as the birthplace of the twin gods Apollo and Artemis (although there seems to be some confusion of Artemis' birthplace being either Delos or the island of Ortygia). Indeed, between 900 BCE and 100 CE, sacred Delos was a major cult centre, where Dionysus is also in evidence as well as the Titaness Leto, mother of the above-mentioned twin deities. Eventually acquiring Panhellenic religious significance, Delos was initially a religious pilgrimage for the Ionians. A number of "purifications" were executed by the city-state of Athens in an attempt to render the island fit for the proper worship of the gods. The first took place in the 6th century BCE, directed by the tyrant Pisistratus who ordered that all graves within sight of the temple be dug up and the bodies moved to another nearby island. 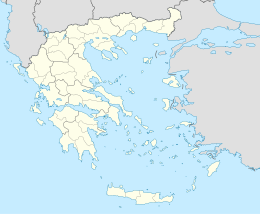 In the 5th century BCE, during the 6th year of the Peloponnesian war and under instruction from the Delphic Oracle, the entire island was purged of all dead bodies. It was then ordered that no one should be allowed to either die or give birth on the island due to its sacred importance and to preserve its neutrality in commerce, since no one could then claim ownership through inheritance. Immediately after this purification, the first quinquennial festival of the Delian games were celebrated there. Four years later, all inhabitants of the island were removed to Atramyttium in Asia as a further purification. After the Persian Wars the island became the natural meeting-ground for the Delian League, founded in 478 BCE, the congresses being held in the temple (a separate quarter was reserved for foreigners and the sanctuaries of foreign deities). The League's common treasury was kept here as well until 454 BCE when Pericles removed it to Athens. 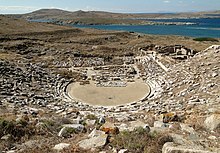 The Roman destruction of Corinth in 146 BCE allowed Delos to at least partially assume Corinth's role as the premier trading center of Greece. However, Delos' commercial prosperity, construction activity, and population waned significantly after the island was assaulted by the forces of Mithridates VI of Pontus in 88 and 69 BCE, during the Mithridatic Wars with Rome. Before the end of the 1st century BCE, trade routes had changed; Delos was replaced by Puteoli as the chief focus of Italian trade with the East, and as a cult-centre too it entered a sharp decline. Due to the inadequate natural sources of food and water, and the above history, unlike other Greek islands, Delos did not have an indigenous, self-supporting community of its own. As a result, in later times it was uninhabited. Since 1872 the École française d'Athènes ("French School of Athens") has been excavating the island, the complex of buildings of which compares with those of Delphi and Olympia. In 1990, UNESCO inscribed Delos on the World Heritage List, citing it as the "exceptionally extensive and rich" archaeological site which "conveys the image of a great cosmopolitan Mediterranean port". The small Sacred Lake in its circular bowl, now intentionally left dry by the island's caretakers to suppress disease-spreading bacteria, is a topographical feature that determined the placement of later features. 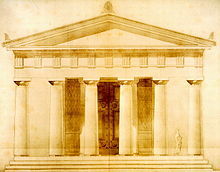 The Temple of the Delians, dedicated to Apollo, is a classic example of the Doric order. Beside the temple once stood a colossal Kouros of Apollo, only parts of which remain extant. Dating to the 6th Century BCE, parts of the upper torso and pelvis remain in situ, a hand is kept at the local museum and a foot in the British Museum. The Temple of Hera', circa 500 BCE, is a rebuilding of an earlier Heraion on the site. The House of Dionysus' is a luxurious 2nd century private house named for the floor mosaic of Dionysus riding a panther. ^ The combination -nth- is a marker for Pre-Greek words: Corinth, menthos, labyrinth, etc. A name Artemis and even Diana retained was Cynthia. ^ Tang, Birgit (2005), Delos, Carthage, Ampurias: the Housing of Three Mediterranean Trading Centres, Rome: L'Erma di Bretschneider (Accademia di Danimarca), p. 14, ISBN 8882653056. ^ Tang, Birgit (2005), Delos, Carthage, Ampurias: the Housing of Three Mediterranean Trading Centres, Rome: L'Erma di Bretschneider (Accademia di Danimarca), pp. 14, 32, ISBN 8882653056. Claude Vial, Inscriptions de Délos. Index, tome II: les Déliens (Paris: De Boccard, 2008). Delos: Island at the Center of the World. Princeton, New Jersey: Films for the Humanities and Sciences, 2006. Wikimedia Commons has media related to Delos.